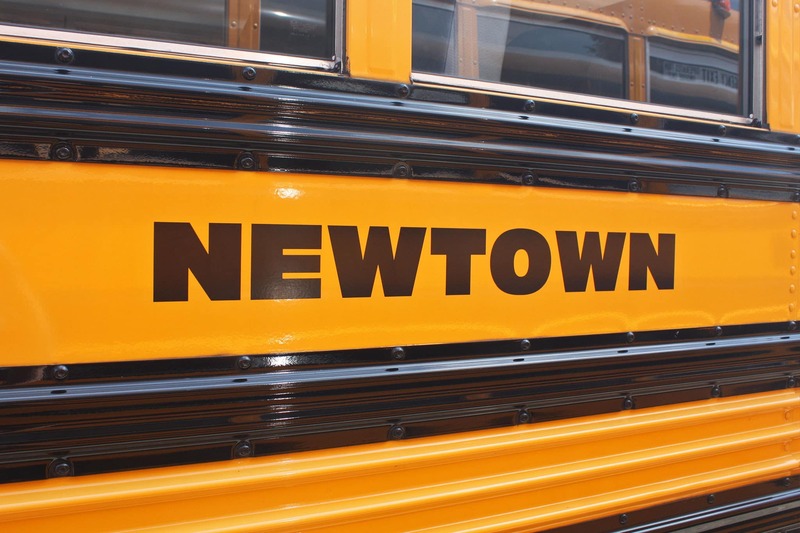 The school bus routes for the Newtown public/private schools are listed under the school that the students will be attending. You can find bus routes here. Residents are asked to share issues or concerns with their child’s bus stop location by calling All-Star Transportation at 203-304-9778. Bus schedules are subject to revisions that result from enrollment changes, transfers and address changes. Changes and/or additions will be posted to the school district’s website and residents are encouraged to frequently check the website. The time for each bus route is the approximate time the bus will make its first pickup in the morning. Adjustments will be made as necessary and as soon as possible. Students should be at their stops 10 minutes before the time listed on the bus route. The stop times can vary 10 minutes either way, depending on traffic, weather and the number of students riding the bus. Please do not worry if a bus is late, especially at the start of a school year when it typically takes a few days for kindergarten children and new students to become accustomed to the bus routes and schedules. If, however, you have concerns about your bus being consistently late over a period of several days, please contact the Newtown office at 203-304-9778. Listed below are the school hours and bell times. Kindergarten hours for Hawley Elementary School, Head O’Meadow Elementary School, Middle Gate Elementary School and Sandy Hook Elementary School are 9:05 a.m. to 3:37 p.m., with arrival at 8:45 a.m. Listed below are the school hours for planned early dismissal and delayed openings. Newtown High School – 10:00 a.m.
Newtown Middle School – 10:00 a.m.
Reed Intermediate School – 11:05 a.m.
Hawley Elementary – 11:05 a.m.
Head O’Meadow Elementary – 11:05 a.m.
Middle Gate Elementary – 11:05 a.m.
Sandy Hook Elementary – 11:05 a.m.
St. Rose of Lima School – 9:50 a.m.
Fraser Woods Montessori School – 10:15 a.m.
Housatonic Valley Waldorf School – 10:15 a.m.
Newtown High School – 12:32 p.m.
Newtown Middle School – 12:32 p.m.
Reed Intermediate School – 1:32 p.m.
Hawley Elementary – 1:37 p.m.
Head O’ Meadow Elementary – 1:37 p.m.
Middle Gate Elementary – 1:37 p.m.
Sandy Hook Elementary Schools – 1:37 p.m.
St. Rose of Lima – 12:50 p.m.
Fraser Woods Montessori School – 1:00 p.m.
Housatonic Valley Waldorf School – 1:00 p.m. Listed below are the school hours for early dismissal and delayed openings for emergencies. Newtown High School – 11:00 a.m.
Newtown Middle School – 11:00 a.m.
Reed Intermediate School – 12:32 p.m.
Hawley Elementary – 12:37 p.m.
Head O’Meadow Elementary – 12:37 p.m.
Middle Gate Elementary – 12:37 p.m.
Sandy Hook Elementary – 12:37 p.m.
St. Rose of Lima School – 11:50 a.m.
Fraser Woods Montessori School – 12:00 p.m.
Housatonic Valley Waldorf School – 12:00 p.m.
Newtown High School – 11:32 p.m.
Newtown Middle School – 11:32 p.m.
Head O’ Meadow Elementary – 12:37 p.m.
Sandy Hook Elementary Schools – 12:37 p.m.
St. Rose of Lima – 11:50 p.m. In the morning, Henry Abbott Tech Students will ride shuttle routes to Newtown Middle School where they transfer onto Bus 34 to Henry Abbott Tech. Bus 34 will depart NMS approximately 6:45 am. On days when Newtown Public Schools are closed students are required to get their own transportation to Newtown Middle School by 6:40 a.m. to meet bus. Please call All-Star at 203-304-9778 with questions. In the afternoon, Henry Abbott Tech Students ride home direct from HAT on Buses 34 & 39 to Newtown High and Middle Schools to ride buses home. Drop-offs at locations other than home require approval. Please call All-Star at 203-304-9778 with questions. For weather-related delayed openings, buses and times will follow Newtown’s schedule, regardless if Abbott Tech opens on time. If Newtown closes due to inclement weather, NO bus service is available for this school. In the morning, students will ride shuttle routes to Newtown Middle School where they transfer onto Bus 50 to Nonnewaug HS. In the afternoons, students will be picked up at Nonnewaug by All-Star Transportation (Bus 42) and returned to town. Parents may opt to pick up their child at a central location in town; however, prior arrangements must be made with All-Star Transportation (203-304-9778 ). We cannot drop students unless you make the appropriate arrangements. For weather-related delayed openings, buses and times will follow Newtown’s schedule, regardless if Nonnewaug opens on time. If Newtown closes due to inclement weather, NO bus service is available. In the morning, Danbury Magnet Students should meet at either the front of Reed School or at the Exit 9 Commuter Lot. Bus 36 will depart Reed approximately 7:55 a.m. and should arrive at Exit 9 Commuter Lot for 8:05 a.m. In the afternoon, students ride back to Newtown on Bus 36. There are two stops in the afternoon, Exit 9 Commuter Lot (3:50 p.m.) and then at the front of Reed Intermediate School. Drop-off times may vary due to traffic on I-84. Please call All-Star at 203-304-9778 with questions. For weather-related delayed openings, buses and times will follow Newtown’s schedule, regardless if Danbury opens on time. If Newtown closes due to inclement weather, NO bus service is available. For Frasier Woods and Housatonic Valley schools, parents must contact All-Star Transportation directly at 203-304-9778 to arrange transportation. Students in kindergarten through fourth grade must be met at the bus stop by a parent, known adult or older sibling. If no parent, known adult or older sibling is at the bus stop, children will be transported back to their home schools. If a family chooses, a waiver may be signed that will allow a first- through fourth-grade child to disembark from the bus, even if no adult is there to meet the children. Please check your child’s school webpage for the complete procedure and download the waiver. No waiver will be accepted for a kindergarten student – an adult or older sibling must always be present. Bus Waiver Form: A waiver allows a bus driver to release a student if no adult is visible at a stop. (Note: If an adult is waiting in a car, that person may not be visible to the school bus driver.) Waivers apply only to students in grades 1-4. You can find the waiver form here. No waiver will be accepted for a kindergarten student – an adult or older sibling must be present. Stop Change Form: If a family has moved or if a student will be getting on/off at a stop different from the home address on a daily basis, this form must be completed. A stop change form is not intended to specify where someone wants a stop; it is solely for notification that their child will not get on/off the regularly scheduled stop, but rather at another regularly scheduled stop. Parents wanting a different stop for their children, transportation to childcare or a waiver must put their requests in writing. A change form is available here. If you have questions, please e-mail [email protected] or call All-Star Transportation at 203-304-9779. 1. In order to maintain the pickup times listed below, Newtown Public Schools requests that students be at their bus stop 10 minutes prior to their scheduled pickup time. 6. Students should cross at least 10 feet in front of the bus; if they can’t see the driver then the driver can’t see them. 12. Keep your bus clean. If you have any questions, please contact All-Star Transportation’s Newtown office at 203-304-9778.